Easy to make and perfect for gifting, Old Fashioned English Toffee dusted with grated almonds – a family favorite for generations! 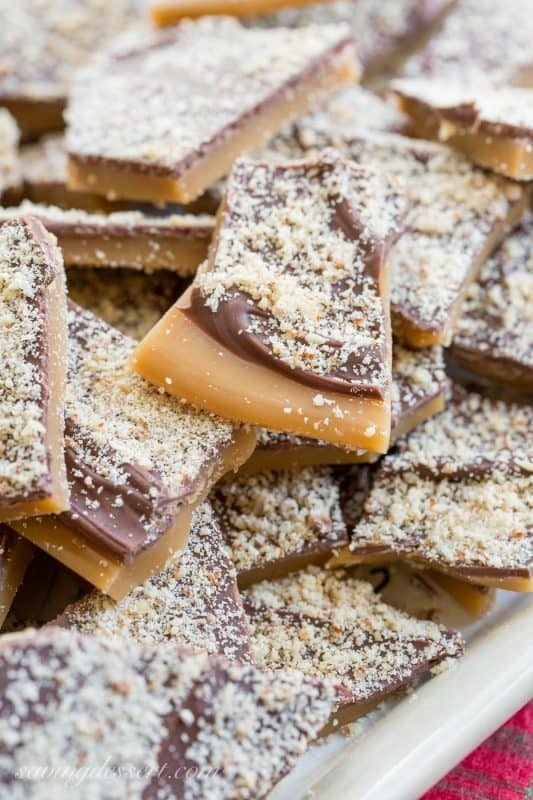 English Toffee is a favorite treat of all our friends and family. It will become one of your family favorites too! Don’t be afraid to make it because it’s pretty easy and even if it’s not perfect, it still tastes great. If you haven’t ever tried making homemade candy, this may be a good recipe to start with. I received this recipe years ago from my friend Gretchen who also was my hairdresser. We moved 600 miles away so I had to finally break down and find a new hairdresser friend, but when I was still able to visit Gretchen for a haircut, she shared a piece of this English Toffee with me. Gretchen had received it as a gift from another client. I begged her to get the recipe for me and she finally agreed, if I would make it and bring her a small tin each Christmas. She got the recipe and I made it, again and again. Don’t you love a great partnership?! That was more than 20 years ago and I’m still making this same recipe today. 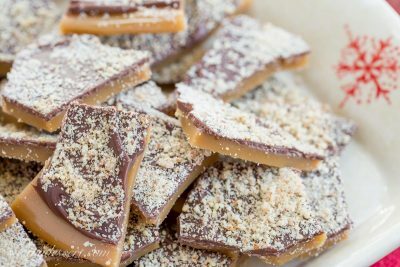 I’ve seen many similar recipes over the years but I think I’ll stick with this English Toffee since I’ve always had great success. This is the actual recipe I received with hand written notes all over the place. My favorite kind of recipe! Using good quality butter and margarine is key to a successful batch of toffee. I speak from experience when I say not all butters and margarines are created equal. You can make the toffee with all butter if you prefer, but I like it best with the combination of margarine and butter. Also, feel free to use whatever brands you normally use, but I recommend Land-O-Lakes Butter and Parkay Margarine. 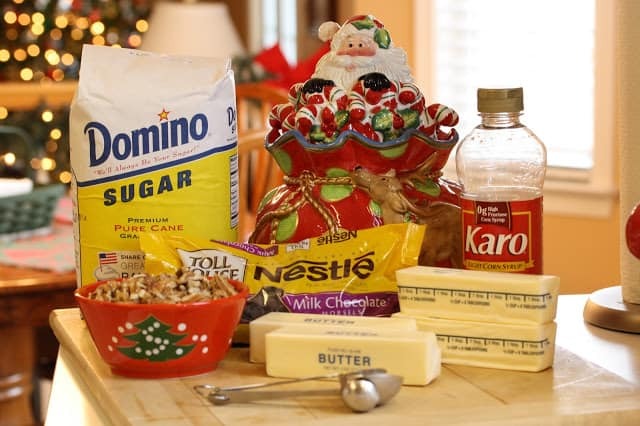 All you need is a few good ingredients: granulated sugar, light corn syrup, margarine, butter, milk chocolate chips, water, and ground almonds or pecans. Have all your ingredients read to go as this recipe moves pretty fast. I also recommend using a candy or instant read thermometer for perfect results every time. Melt butter and margarine in a heavy saucepan. Add the sugar, corn syrup and water. Cook on medium heat (turn down as the mixture starts to darken) stirring constantly until the mixture reaches 310 degrees (hard crack stage). Once the mixture starts to turn a light caramel color, start turning down the heat to prevent it from scorching or turning dark too fast. Pour into a lightly buttered pan approximately 10" x 15". Once slightly set but still very hot, sprinkle milk chocolate chips over the toffee. When the chocolate chips are soft, spread evenly on top of the candy. Sprinkle with ground almonds. Cool and break into bite size pieces. Just wondering why you use butter & margarine in the English Toffee? Can I just use butter? Hi Lori. Using both margarine and butter is the way the original recipe was given to me and that’s the way I started out making the toffee. I’ve used all butter but for some reason prefer half margarine and half butter better. All butter turns out fine so feel free to give it a go. I never buy margarine anymore for the day to day stuff, only when I’m making this toffee or fudge. Also, I always use Parkay margarine – it just works better for me. Thanks for the great question! This is an absolute hit with my family! I have to make my son his own batch. 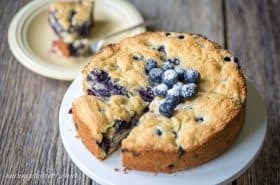 Have you ever tried doubling the recipe and putting it in a bigger pan? Thank you Susan! Feedback is so important for me and my readers. I appreciate you taking the time to let us know how it turned out for you. Best wishes for a fantastic New Year! Hope you’ll let me know if I can ever help you in any way. Hi Lisa. I was already asleep last night when you wrote this. I hope it turned out okay for you. If relying on color only, you will be able to tell as the mixture gets super thick and starts to smell like it’s about to burn. You can also drizzle a little in a bowl of cold water. If it turns brittle, it’s ready. Good luck and thanks for giving it a try! Made this the other day and it was a hit with everyone in the family. The only issue was the chocolate didn’t stick to the top. Any suggestions, or is this just par for the course? Hi Robert. Make sure you put the chocolate on while the toffee is still pretty hot and on the “not yet set” side of things. The chocolate doesn’t stick as well when spread on cool toffee. Sorry about that – it usually isn’t a problem! Thanks for giving it a try. I may have to try this. Candy thermometers intimidate me but this looks so good. And 20 years? It must be worth it! Thanks Abbe – it is so worth it! Love English Toffee!! 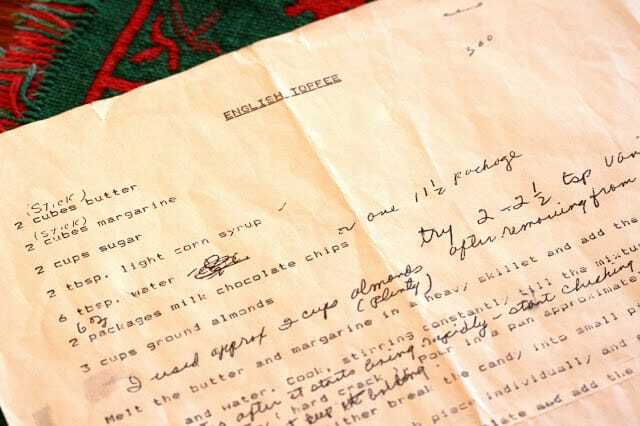 And hand written recipes with notes are always the best recipes and even most memorable ones too! Thanks Anna – have a wonderful holiday! Toffee is my favorite Christmas treat! Yours is a little different than mine as I top with chopped pecans, but I know I’d love your version, too! I’ll have to check out your version Liz. We love it with pecans too! Thanks so much. 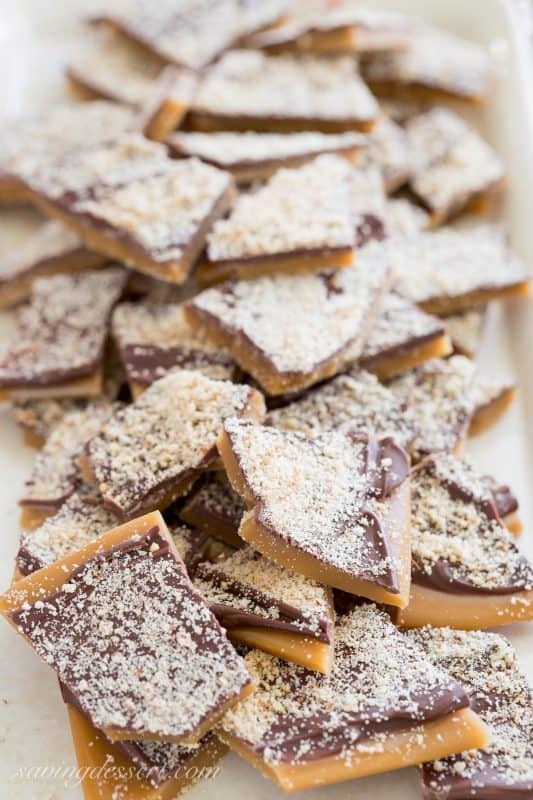 These toffee look so festive and delicious, Tricia. Cool that you are sharing this precious recipe with us. Thanks Susan – I bet your recipe is great too! Thank you. I have been looking for a new holiday dessert. Made the same thing for years. Time for something new. 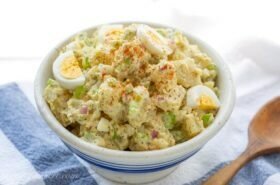 Happy Holidays to you, and Bless you for sharing this recipe. Happy holidays to you too Pat – and thanks so much. You’re going to love this toffee. Everybody does and it is one of my most requested treats I make. 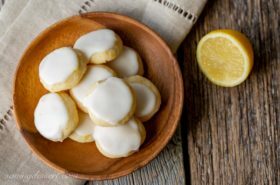 Hope you’ll sign up for our newsletter and get the free e-cookbook with plenty of cookie recipes to try! Thanks again. I like English Toffee but have never made it. Yours looks delicious. Pinned! Thanks Gerlinde – it’s really easy, hope you give it a try. Thanks Pam – you too! I would be hopelessly smitten with this toffee in the house! It probably my favorite candy ever and your version looks amazing! 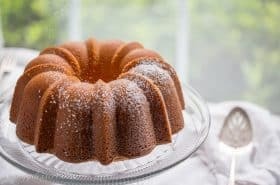 Hi, can I use all butter in this recipe? Thanks! Sure Ula using all butter is fine. I personally prefer the combination of butter and margarine but it is fine either way. Thanks for the great question. Why have you called the recipe English Toffee when the recipe is clearly American. No true British recipe would ask for Corn Syrup simply because it is not easily available here. Thanks for the comment Carol. Corn syrup and golden syrup are very similar in the way they react in recipes. In the US, corn syrup is more common and often used in candy recipes. Thanks for the English recipe. I do not find a way to print this re eipe? Usually a print area. Help! 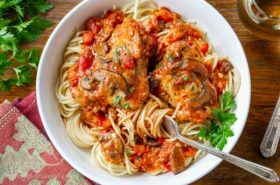 Hey Nancy – I recently transitioned to WordPress from Blogger and have to manually update all my recipes – 4 years of recipes! It’s going to take a while – but I did go ahead and add this one now! Thanks – I really hope you love as much as we do. I’ve already been asked if I was making this again for the holidays. Everybody loves it! Really detailed post! Thanks for all the images, it makes it all the easier to follow the recipe as it goes on. I used all butter instead of butter and margarine and substituted maple syrup for the corn syrup.